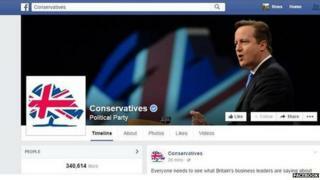 Documents obtained by the BBC show the Conservatives are spending over £100,000 each month on Facebook and as much as £3,000 in individual constituency campaigns. Getting on Facebook costs nothing. Getting noticed can prove expensive. The scale of Conservative spending is revealed in invoices from the website. This one shows the Tories were charged £122,814 in September last year. An invoice from Facebook for November 2014 emerged last month. The cost then was £114,956. Taken together they suggest the Conservatives are spending over £1m a year on one website alone. Documents filed after last year's by-elections also reveal something about Conservative expectations. The invoice above shows the party spent £924 on Facebook supporting its candidate in the Clacton by election - Giles Watling. He was expected to lose to UKIP defector, Douglas Carswell, and he did. Where expectations are higher, the Tories appear to have spent more. Returns following the Newark by election in June, won by the Conservative Robert Jenrick, show he received £2,800 worth of online support. As this document shows, Facebook came more expensive than the traditional election balloons. Matthew McGregor of Blue State Digital advised Barack Obama's 2012 campaign on new media and is now working with the Labour Party. He tells the Today programme: "The Conservatives are spending their money in a way that gets their content in front of people. "The fact they are outspending the Labour Party many, many times over because of the support from millionaire donors is going to have an impact. "That's something the Labour Party can respond to by out-organising the Conservatives." That message suits Labour, whose supporters like to emphasise that the Conservatives have more cash. I understand Labour has been spending less than £10,000 a month on its own Facebook presence. The party has promised not to feature David Cameron on billboards. Online though, the Prime Minister is an important focus. He features heavily on Labour's Facebook page. UKIP have grown used to being embarrassed by their candidates and supporters online, But they too are investing in their online presence - and are happy to go into detail about their strategy. Their social media boss Raheem Kassam (above) reveals not only the data behind UKIP ads but also what images of Nigel Farage prove most successful online. A photo of UKIP's leader with pint in hand staring to camera is less successful than a picture of him in flat cap by a river, looking in the direction of the Facebook 'like' button. Until recently UKIP spent only about £100 a month on Facebook. But at the Newark by election they invested £3,000 in online advertising, and spending will increase. Kassam also reveals that he types Farage's tweets for him; the MEP does not carry a smart phone. He says: "It is a small press release so to say he's not writing it himself, well, who cares? He doesn't write every press release that comes out of this office. David Cameron doesn't write every press release that comes out of Number 10." All the strategists agree: the aim is not to persuade people to nod thoughtfully while they stare at a screen. They want consumers of their online media to make donations or, even better, to get their friends' support or to knock on doors in marginal constituencies. Sometimes that means focusing on existing supporters, and trying to make them do more. That's the aim of the Conservative chairman Grant Shapps' Team2015 campaign. So while politicians are as obsessive as ever about how they are portrayed in the press and the broadcast media, another campaign is taking place online. It is a spending battleground, rich in data, whose troops are marshalled by experts and advisors. None of them though can guarantee their messages will reach beyond their already-committed activists to the undecided voters who will, in the end, decide the election.